Christie (Dickey) is just going about her day as a worker for Metro Telephone when a dying ninja bestows upon her a magical sword. Suddenly, Christie starts acting very weird and ninja-y, which concerns her new boyfriend, police officer and body hair enthusiast Billy Secord (Bennett). As it turns out, the spirit of the ninja has inhabited Christie’s body, and is now attempting to get revenge on the group of cops that murdered him. Now officially a were-ninja, Christie is taken by Billy to a ninja exorcist, or “Nexorcist” as they are known in the biz, Miyashima (Hong). When the ninja’s old rival, Yamada (Kosugi) shows up, things get really complicated. Will the lovely Christie ever be the same again? Or will her closet be forever filled with black outfits and her purse filled with throwing stars? Yes, the above description is entirely accurate and is a real movie. Needless to say, we loved it and you gotta see it! This is a Cannon production directed by Cannon mainstay Sam Firstenberg, who that same year would also direct Lucinda Dickey in Breakin’ 2 (1984). And in 1983, he directed Revenge of the Ninja (1983). 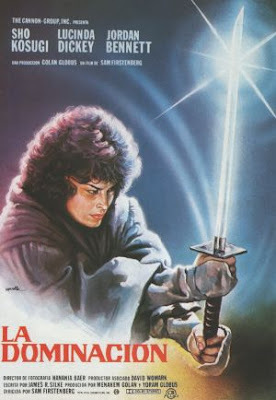 Interestingly, though this movie is called Ninja 3, technically this is the third in a trilogy: Enter the Ninja (1981), Revenge of the Ninja, and this - even though none of these movies were ever called, simply, “Ninja”. Regardless, Ninja III is interesting, entertaining, and certainly never boring. The movie is filled with 80’s genius: great outfits, makeup and hair, Christie has an arcade game called Bouncer in her apartment, and in her spare time does aerobics on shag carpeting. Musicians Harpaz and Segal are credited not with just a score, but a “synth score”! It’s all just awesome. And adding to all the ninja action, stunts and inventiveness, the filmmakers added some horror elements inspired by the Nightmare on Elm Street Series, the Exorcist series and even Ghostbusters. They were obviously unafraid to bend the rules of the ninja movie and crossed genres. The result is a completely fresh take on the ninja boom movie which is a joy to watch. Right from the get-go, when the ninja finds some ninja gear in a glowing box in a cave near a golf course, you know something great is about to happen. And once the “golf cops” show up - watch out! And we didn’t even really talk about the great Sho Kosugi - but he’s present and accounted for, and does his usual great job. Filled with cool moments, there’s so much to love about Ninja III. And you’ll never look at V8 juice quite the same way again. In a good way. "... let's see, where should we put this mystical cave? hmmm, a ... golf course! that's IT!" Haha, that is probably how it was done! The golf course scene is one of the best in the movie because it is totally insane! I can't believe I haven't seen this one yet. I love Sho's other Ninja flicks, so I'm sure it's every bit the classic you suggest. Great write-up! Thanks! It is a ton of silly fun! Looking forward to your take on it. Dude! I just finished this last night! I was gonna do a review on it in the next day or two myself. This movie was.........nuts! But in an insanely awesome way. I loved every ridiculous second of it. Thanks! What a coincidence! Looking forward to your write-up. Got this on DVD-R from Ioffer, and i'm glad I did! Hilariously entertaining from start to finish, it's a real shame they don't make films like this anymore. We can't agree more! This was entertaining from frame one. 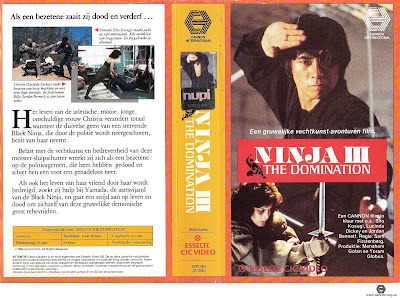 The ninja boom could only happen in the 80s. I had fun with this one too, but I was creeped out by the stalker cop, especially because he gets his woman by being a stalker. Still, this had some great moments. Good stuff. He was a bit weird and also an unnecessary character. Sho and Lucinda were great though. For any UK readers this movie at the time of writing is still on Lovefilm's streaming service and it's an absolute blast! They don't make them like this any more. Great review Ty. This is still one of the most popular reviews on my blog. Thanks! That is great that Ninja III is one of your most popular reviews! That is cool that the movie is streaming online in the UK. The US VHS is s little expensive on Amazon. YES! 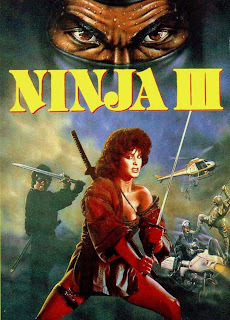 Love Ninja III! Like the Exorcist, but with Ninjas! I did always wondered where Ninja I and II came from, but I guess it does kind of work with Enter and Revenge! Kosugi rules. Did you catch him in Ninja Assassin a few years back? We are big Sho fans! He always delivers the goods. He did a pretty decent job in Ninja Assassin. It was nice to see him again. OMGOSH! I just watched the other night! Crazy thing is, this movie used to scare me as a child. :x Don't judge me! I loved this movie, the music/sound effects always made me giggle. I never seen 1 or 2...weird isn't it?? That is a weird coincidence that you just watched it. I can definitely see being scared by it. There are some pretty horrifying scenes. We don't judge you at all! Has anyone mentioned how spectacular the poster/box art is? That La Dominacion image is awesome. btw - Thanks for joining The Tommy Gun Times! The box art is totally killer! About your site: Was happy to join! This is a pretty great flick - the opening 20 minutes on the golf course is amazing. Then it dies down a bit and there's a distinct lack of Sho until the final 20 minutes. Got to say this is probably the weirdest hybrid movie. It's like the writer watched The Exorcist, Flashdance and Revenge of the Ninja then sat down to write the movie. Agree about the stalker cop being creepy. Can't agree more, Jack! This was a blast. They don't make them like this anymore! The stalker cop hurt the movie a bit though. But the hybrid of Sho ninja action and "Breakin" style dance was an odd but fun mix! I've been watching this movie since I was 9 (1984) I have every scene memorized. I am a Ninja- No one or nothing can stop me.